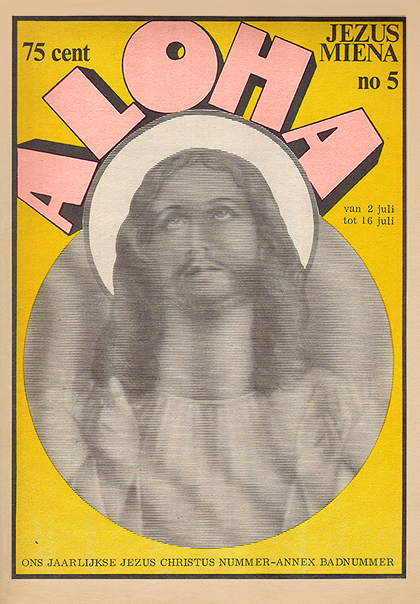 Aloha started in 1965 as a music magazine called Hitweek, equipped with the first four-color offset printer in the Netherlands. 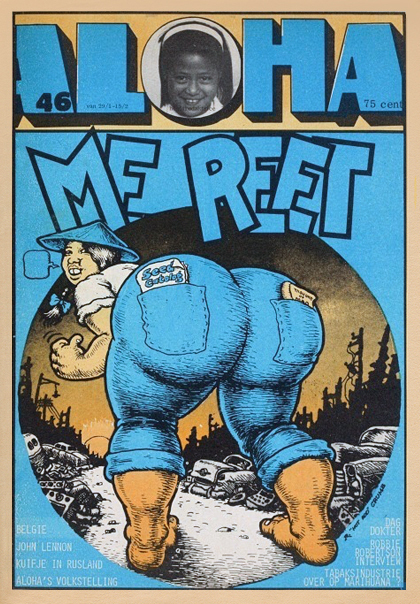 In 1969 it changed its name to Aloha, a magazine focused on music, graphic design, comics and counterculture alongside national and international social issues. Aloha was independent and operated without permanent writing staff or editors, so everybody was welcome to write an article or publish a drawing. Aloha was ironic, critical, unconventional and seasoned with absurd humour. Produce a publication where a new generation could feel free of manipulation and produce their own content. It offered critical reports about political and social issues beyond the official version given by the conventional media and some tricks on how to endure "outside" the system. f.i. On number 35 (1970), Aloha offered a free small guide for diggers called "Free and surprising Amsterdam" where you could find all kind of suggestions to survive in the city without any money. This satirical and radical tradition later continued in ‘Frietkaas’.